A new born brings happiness and vitality into your life. Along with the joy, it also brings in special nutritional requirements for a new mother. 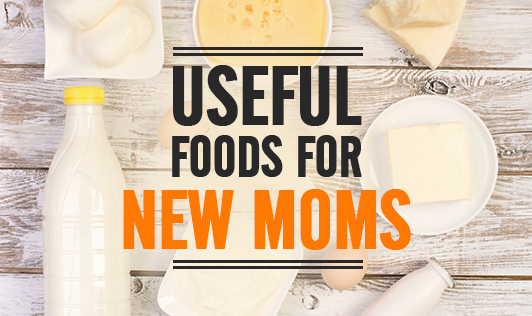 If you've had a baby recently, here are some foods that will bring you the required nutrients for new mums. Low Fat Dairy- Whether you prefer milk or curd, dairy foods form an important part of a new mother's diet for calcium, protein, vitamins B2, B12 and D.
Fish- If you eat non-veg, fish is good for you for protein and omega 3 fatty acids. Pulses- If you are vegetarian, pulses in combination with cereals, bring you good quality proteins, iron, B vitamins and fiber. Fruits- They provide a variety of vitamins, minerals, fiber and antioxidants which are vital for new mums. Leafy Greens- For your requirement of calcium, iron, vitamins C, A and fiber, use these vegetables regularly. Whole Grains- Brown rice, whole wheat chapati, ragi, jowar, etc give you the much required energy along with B vitamins and fiber. Eggs- For high quality protein along with vitamins B, D, choline and iron, and if you like the taste, eat an egg often when you are lactating. Motherhood is much more complete if you receive good nutrition and pass it on to your child.